A tightly connected progression forms the conceptual sequence of Symphony Math®. 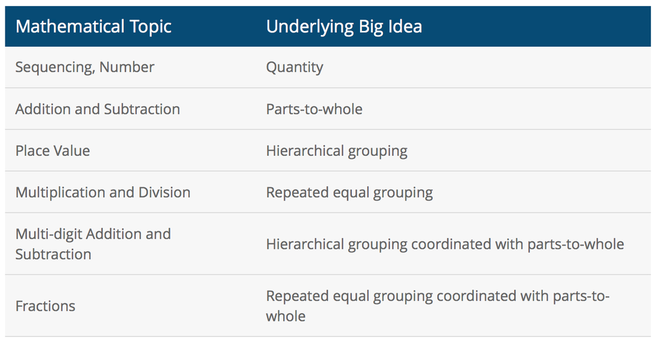 These underlying “big ideas” provide the foundation for mathematical learning. As students master each big idea before moving on to the next, they learn to succeed with more complicated math later on. Six distinct activity environments provide multiple representations of each concept and integrate with the conceptual sequence. By “seeing” mathematical concepts, students develop mental models for meaning. 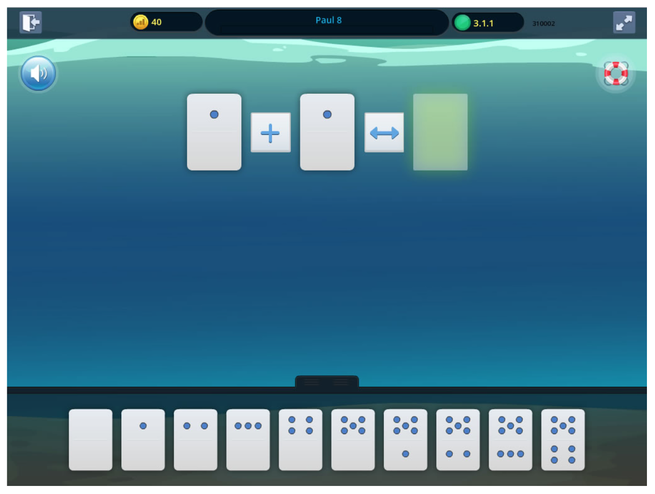 In the screen below, a student must place a card with 2 dots to show that 1 + 1 = 2 (the part-to-whole concept). Manipulatives automatically appear to help students working at this abstract level. Story problems deliver real-life applications of the concepts and help students who learn better through narratives and examples. This learning environment fosters fluency once a student has demonstrated understanding of a concept using manipulatives, symbols, language, and story problems. Instructive feedback encourages independent thinking by revealing the nature of each incorrect response. For example, if a student answers 3 + 2 = ? with a 6, the program immediately shows that a 2 bar combined with a 3 bar is not the same length as a 6 bar. This approach helps students deduce for themselves why an answer is incorrect. This also is preferred to saying, “That’s not quite right, try again,” which often leads to guessing and no meaningful explanation of why the response was incorrect. 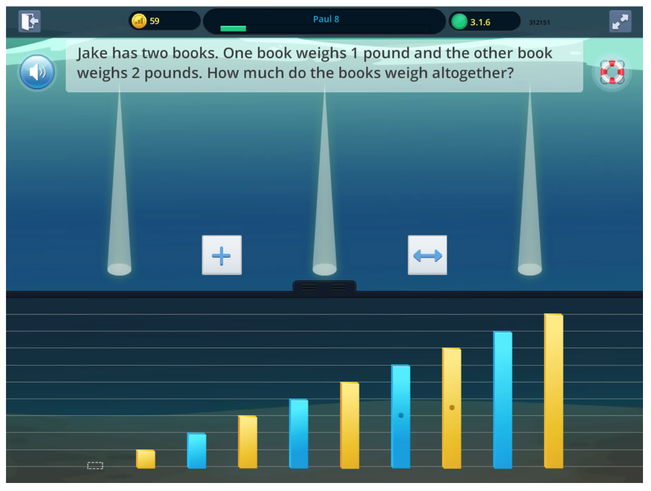 The “Help” button provides scaffolding that leads the student closer to the solution, but does not give the answer immediately. 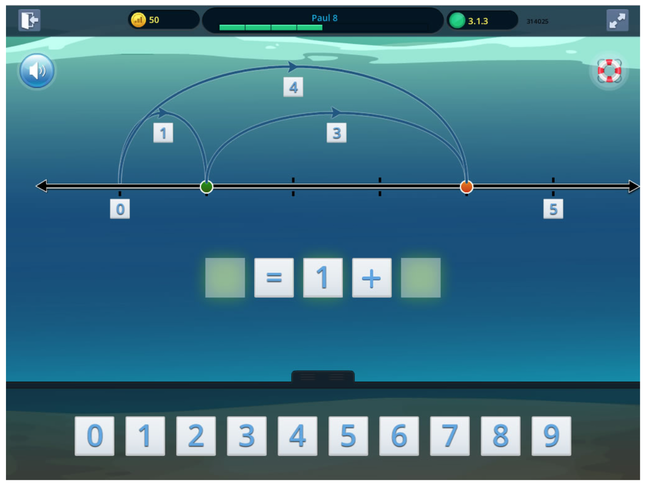 For example, if a student is working on 8 + 1 = ?, she can press the “Help” button to activate scaffolding that will help her connect 8 + 1 with her knowledge of concepts and number relationships. Pressing the “Help” button again provides additional scaffolding. Hints include the addition of visuals onscreen, re-ordering of possible solutions, and inclusion of one of the elements of the correct solution. As scaffolding does not directly provide correct answers, students develop long-lasting problem solving skills and reduce their dependence on technology for solutions. 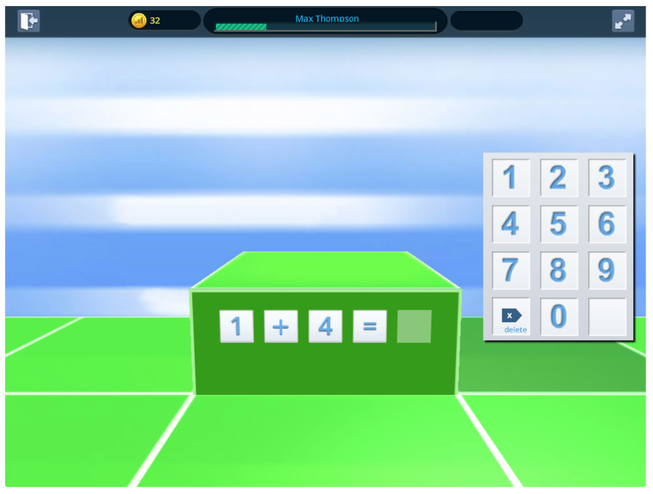 Each stage in Symphony Math® features uniquely designed problems that emphasize comprehension and problem solving. 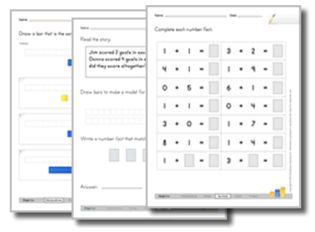 For example, to master place value concepts, students solve a series of problems to understand the base ten system. Students combine numbers of different place values, such as “30 + 400 + 7 = ?”. They also create number sentences for which the sum is provided but the addends are missing, such as “? + ? + ? = 286″. Each addend must correspond to the ones, tens, and hundreds place value (e.g. 200 + 80 + 6 = 286). At the most difficult level, students provide three different solutions to this type of problem. Students also learn to problem solve by connecting current problems to similar easier ones they answered previously. 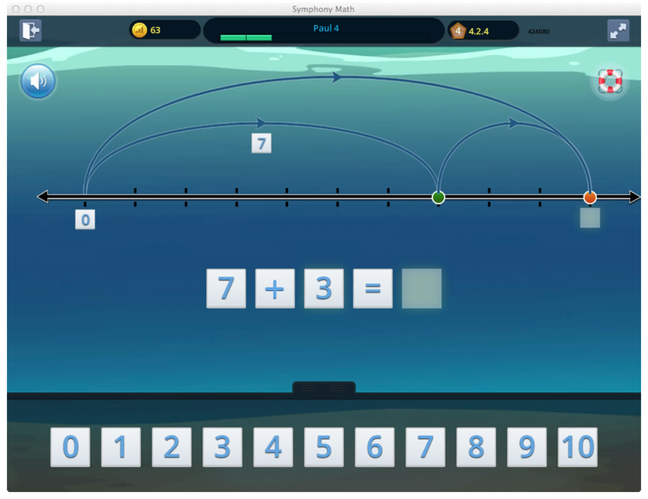 The dynamic branching of Symphony Math® allows students to learn at their own levels. As the program illuminates an area of need, progress slows until the student achieves the necessary understanding. For example, the graphs below represent the progress of two third grade students who used Symphony Math® for the same amount of time. The student on the left required relatively little practice to demonstrate mastery, whereas the student on the right needed more practice to fully grasp the concepts. Help indicators in Symphony reports suggest Guided Practice by comparing student performance to a nationally representative sample. For every suggestion, a simple click allows easy access to Guided Practice worksheets. Links to Latest Award certificates have also been added so that you can celebrate student achievement in the Symphony Math program.